So these little suckers are SO cool. 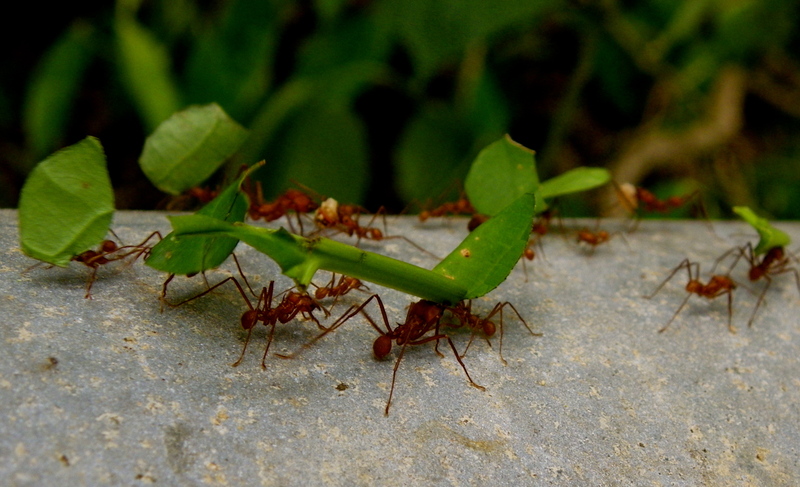 I first saw a colony of leaf-cutter ants while I was in Granada, Nicaragua. Their paths span for hundres of feet and even sometimes more than a mile, and they all have one solid mission: to bite off chunks of a specific leaf, and carry it all the way back to the colony. But here is the kicker: the ants do not eat the leaves. They feed the leaves to a certain type of fungus, which thrives off of it, and they in turn eat this fungus. What a wonderful example of symbiotic relationships. I am sure you are already well aware of Radio Lab. If not, it will blow your mind! Here is one of my most favorite pod casts about the science of emergence and ants are used as a reference quite a bit. Very cool you are into this stuff!